3rd January 2019, Hatfield, UK: Antenova Ltd, manufacturer of antennas and RF antenna modules for M2M and the Internet of Things, has developed a new SMD positioning antenna that achieves an extraordinary level of accuracy in the GNSS bands – it can pinpoint a location to within centimetres. The Raptor antenna utilises the L2, 1200 MHz satellite bands which recently became available for civilian use. It is the latest addition to Antenova's lamiiANT range of rigid FR4 antennas which are designed for easy insertion onto a PCB. The antenna itself is very small - it is a GPS single feed antenna in SMD form, measuring just 16.0 x 8.0 x 1.6 mm, which makes it suitable for small PCBs within all kinds of small electronic devices. 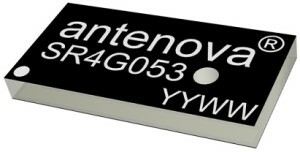 "This is an outstanding antenna, because it achieves the same precision as a much larger, heavier ceramic patch antenna, but in a very compact SMD part," says Colin Newman, CEO of Antenova, "A ceramic antenna would need to be 35mm x 35mm to achieve a similar level of accuracy and performance." Raptor is supplied in Tape & Reel for ease in high volume manufacturing applications. The addition of the L2 frequency band combines multi-band satellite signal reception and GNSS correction data. This helps to mitigate position errors, greatly improving accuracy, especially in urban areas. As well as improving tracking, the L2 band is beneficial for UAV's, Drones, Autonomous Vehicles, Agriculture, grid mapping and many other similar emerging applications. Antenova will be showing samples of the Raptor antenna at CES, so for more information please visit Antenova at the show, booth #2220 in the Westgate hall, or visit www.antenova.com. Antenova's broad range of standard antennas and RF modules are ideally suited for GSM, CDMA, 3G, 4G, LTE, 5G-NR, NB-IoT, GPS, GNSS, WiFi, Bluetooth, ZigBee, LP-WAN, LoRa, Sigfox, Weightless-P and ISM, for M2M and IoT applications. One of Antenova's latest antennas, the Robusta chip antenna from the company's ROBUSTA range, for use on metal surfaces and IoT applications, was the winner of the Hardware Award at Embedded World 2018.